Managing bookings has never been that simple. 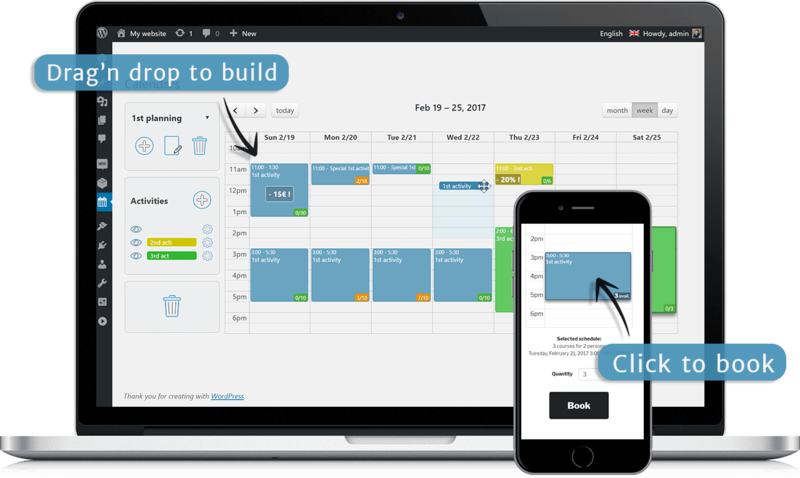 Build drag-and-drop calendars. Book with one click. From reservation to payment, we take care of everything. Perfectly integrated with WooCommerce. 100% customizable display, 100% multilang, 100% responsive. Many add-ons available to meet all your needs, and an API for developers. Booking Activities is thus perfectly adapted to tourist activities, sports, leisure, but also to courses and other cultural activities… and probably to YOUR activity! You can preview the plugin on the demo website as well as in the video below. A question, a request, anything?